Utilities need to prepare for the rise of wind and solar power and the retirements of baseload power plants, and that includes building “solar protection factors” into their long-term planning. That’s one of the recommendations from consultancy ScottMadden in its latest energy industry update. The report, which covers subjects ranging from Trump administration energy policies, toblockchain to smart cities, also gets into detail on today's key grid paradigm shift -- the increasingly frequent retirements of coal and nuclear power plants and their replacement by natural gas and renewables. In the past decade, for the first time ever, baseload retirements outpaced baseload additions, with 23 gigawatts of net retirements since 2010, the report found. Of the 84.2 gigawatts of retirements, 61 percent were coal and 29 percent gas steam turbine plants, while the 61.1 gigawatts of additions have been 74 percent combined-cycle natural gas and 24 percent coal steam turbines. The average age and size of retiring power plants have also both been rising over the past decade, and a significant portion of what’s left is aging -- nearly 7 percent of today’s baseload capacity is over the age of 50, and more than 23 percent is 40+ years old, the report finds. Natural gas, meanwhile, is continuing its trajectory of increasing supply and falling prices. This is being driven by the boom in shale gas production, which has outstripped some longstanding supply sources. Utilities are looking for ways to hedge natural-gas procurements, as the report describes in a rundown of U.S. and Canadian policy changes on this side of the energy business. While natural-gas use is growing exponentially, natural-gas-fired power plants are seeing some challenges from the rise of intermittent wind and solar power -- most notably in California. State grid operator CAISO saw curtailments of renewable generation from wind and solar jump 46 percent in the first two months of 2017 compared with the same months last year. At the same time, the frequency of negative prices -- times when the CAISO market is essentially paying people not to generate power -- rose to 13 percent of all hours in February. Solar power’s production curves have led to increasingly steep ramps in the late afternoon and evening demand for grid operators to manage, manifesting in the form of California’s “duck curve.” Bigger ramps will require more peaking capacity, which could be a market for natural-gas power plants. However, there’s little incentive to participate in the market, given the low power prices driven by rising renewables and today’s low gas prices. All of these factors are coming into play in the pace of baseload retirements in the state. In February, Calpine announced that it was retiring four gas turbine plants in CAISO territory, each less than 15 years old, while La Paloma Generating LLC, owner of the 1,022-megawatt La Paloma power plant, declared bankruptcy. Last year, Calpine placed its 672-megawatt Sutter Energy Center into “cold lay-up,” and Dynegy said it would retire 1,500 megawatts at its Moss Landing facility -- both for economic reasons. And CAISO has recently indicated that another 10 gigawatts of gas-fired generation may be at risk of retirement for economic reasons. To deal with these challenges, ScottMadden describes a general guideline to assess solar oversupply risks, which it dubs the “solar protection factor.” The SPF is built on calculations of the grid’s “oversupply cushion,” or an estimate of how much non-baseload generation is needed at times of minimum midday load, and “solar headroom,” or the amount of solar capacity that can be added to the system before experiencing solar oversupply risks. 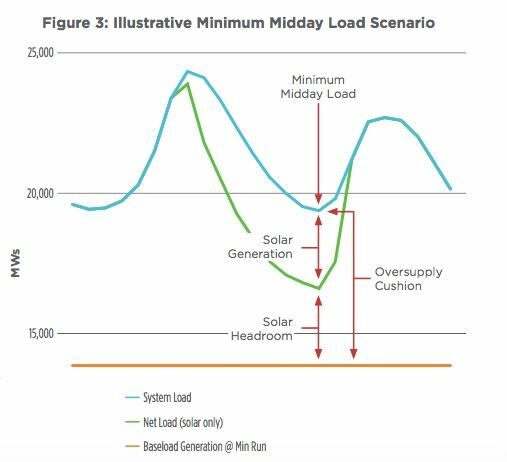 It then divides solar generation by minimum midday load, minus its “minimum-run” baseload generation, to derive the system’s SPF, as shown in this illustrative graph. 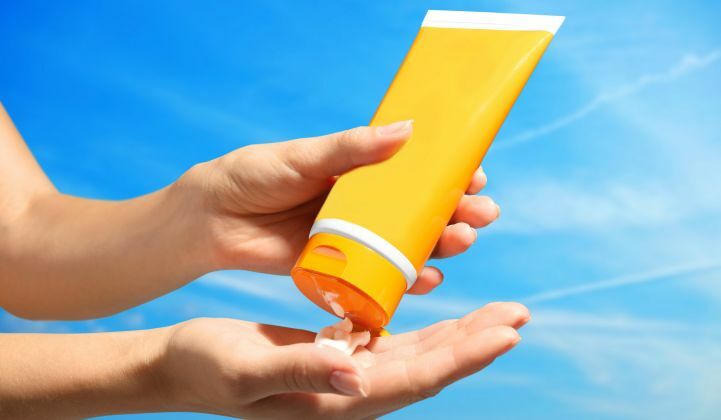 In simple terms, an SPF value greater than 1 provides “directional evidence of oversupply risk” at midday during the minimum midday load. Of course, this calculation leaves out some important factors, such as trading between grid operators, or the operational effects of variable wind generation, which could allow systems to handle much greater penetrations of solar without excessive risk. Measures like these can help clarify the disconnect between the relatively small share of utility-scale solar in terms of nameplate capacity and their outsize effects at times when they're generating at top capacity, the report notes. For example, while less than 10 percent of California's net generation comes from utility-scale solar, it made up nearly 40 percent penetration of CAISO's minimum daytime load in 2015. Calculations like these will become increasingly important in years to come in vanguard markets like California and Hawaii. One solution could be innovative solar power-purchase agreement (PPA) structures, such as the experiment between ScottMadden, the Smart Electric Power Association and Hawaiian Electric with a PPA structure that includes capacity as well as energy pricing, time-of-day pricing and renewable dispatch generation. Even coal-rich regions aren't immune to the new market dynamics that come with ever-cheaper natural gas, wind and solar power power, even if they're seeing a slower shift. Mid-Atlantic grid operator PJM has projected that it can keep its grid stable as coal and nuclear plants are replaced by natural gas and renewables, at least up to about 20 percent renewable penetration. Midwestern utility Xcel Energy and Western utility PacifiCorp are integrating record amounts of wind, while closing coal power plants. These changes are likely to continue, despite the Trump administration's efforts to undo climate change and green energy incentives and programs, the report predicts. While executive actions on cutting budgets and de-prioritizing research can move ahead fairly quickly, more comprehensive deregulatory activity may "prove more difficult and time-consuming, in some cases requiring new rulemakings and notice," with inevitable litigation to follow. There may be some potential for bipartisan collaboration on issues such as nuclear power, which several states are supporting as a carbon-free resource, or on transmission development, which is potentially part of a larger federal infrastructure effort, the report noted. But underlying economic factors and state policies are likely to influence trends more than federal action.